With today's high priced fuel ever on the rise, and the competitive environment in the industry, trucking companies need an economical shelter to protect and repair trucks in. Archcore steel truck garages are the ideal solution when used for truck storage or truck repairs. Our arch style truck garage kits are totally prefabricated for simple construction. With widths ranging from 10' to 140', unlimited lengths, and heights up to 30', working on any type of semi, dump truck or large heavy equipment is made simple in our pre-fab garage kit buildings. Archcore uses only the highest quality heavy gauge steel to outperform and outlast years of rigorous use. Every truck garage kit has a 35 year warranty against rust on the Galvalume steel and provides years of maintenance free use. Archcore steel truck buildings are versatile and can be custom sized to fit existing foundations or unique building sites. Whatever the size of your operation, there is an Archcore truck garage building model that will work for you. If you have a tight space and need only a one bay garage our "P" and "S" Models can be designed to be very narrow yet provide the necessary height. For multiple trucks or bulk truck storage, our "S" Models or high profile "Q" Models offer the most economical steel building pricing anywhere. Archcore truck storage buildings are totally pre-fabricated and designed for the customer to erect themselves. 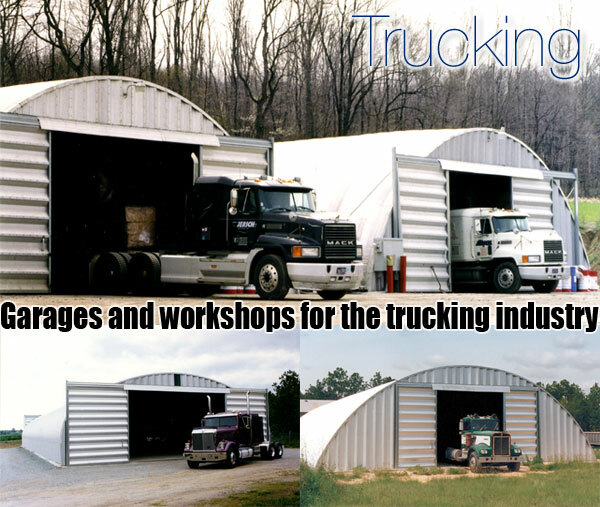 They offer the most affordable solution for a truck repair or storage facility with the lowest cost of construction. Contact Archcore now and let us design a truck storage building for your operation.